Here are my 3D CAD model and drawings for recreating the bench seating on my 1986 Four Winns Liberator 211 boat. I disassembled and measured the original bench to recreate it, since the old item had decayed from years of getting wet. Four Winns appears to use this bench on many of its interior designs, even still these many years later. This project requires less than one sheet each of 1/2 and 3/4 inch marine plywood, several fir 2x4s, a 24 x 72 x 2 inch sheet of upholstery foam, about 3 yards of marine grade vinyl fabric, various stainless fasteners (screws and staples), some 3M 5200 marine polyurethane adhesive-sealant, and 2 mil polyethylene sheeting. It took me about 10 hours to cut and assemble. 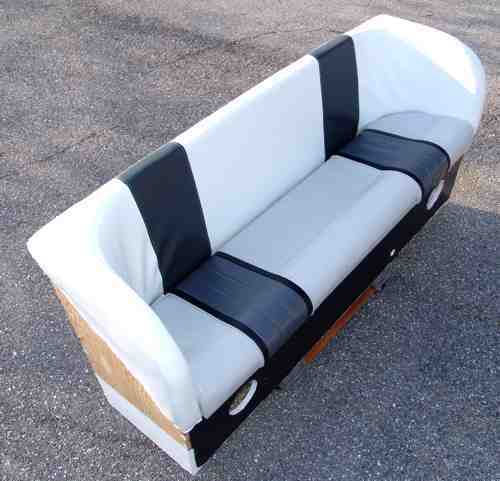 A bench like this costs about $1000 from a custom upholstery shop, so this is a very economical do-it-yourself project. The old seat bottom was in good condition and not replaced. It is a simple D-shaped plywood cutout covered with some foam and stapled vinyl. Cleats on its bottom surface lock it into the bench underneath, such that it lifts out to reveal a large storage space underneath. Typical view of wood framing model. 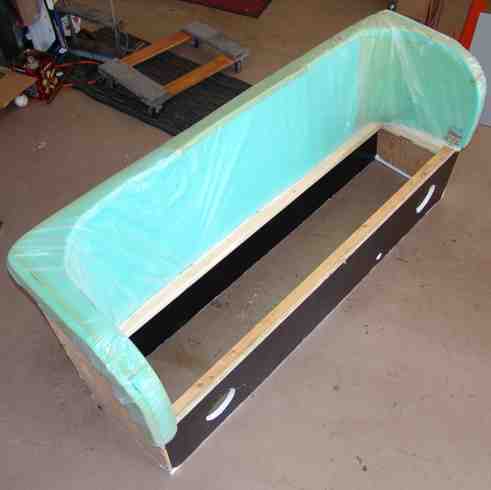 Frame covered with upholstery foam and polyethylene slip. Finished project with marine vinyl upholstery. The sides and back face the boat hull and are not exposed when installed. The lower front will be covered with deck carpeting. The large holes are cutouts for stereo speakers. Thumbnail of typical drawing sheet. Model: You can inspect a 3D solid model [Autodesk DWF file]. (This requires the free Autodesk DWF Viewer). The viewer allows you to rotate ("orbit"), pan and zoom the 3D model of the bench framing, so you can inspect and understand the construction. Drawings: Measured drawings for the framing (0.9 MB PDF file, 9 pages). Includes fastener notes and upholstery notes for those aspects of finishing, which are not shown graphically in the drawings. Have a comment or question about my Four Winns style boat bench?